We make only digital x-rays without a traditional film (consequently – without time consuming development process). 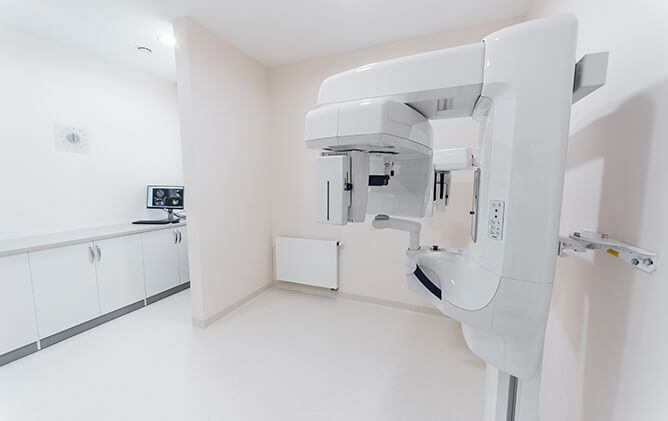 Thanks to the latest-generation digital sensor and a CCD camera as well as an immediate connection to a PC computer it reduces the radiation dose for a patient to 70%, it shortens the exposure time and shows images in real time without the time-consuming plate developing. A digital X-ray machines guarantees the best recognition of all anatomical details and the highest definition improving the diagnostic value of an image to a maximum. Moreover, the images are distinguished by perfect geometry and a fixed zoom rate. Furthermore, permanent internal microprocessor control of efficiency and service accuracy guarantees patient’s full safety and individually-set minimal radiation dose.